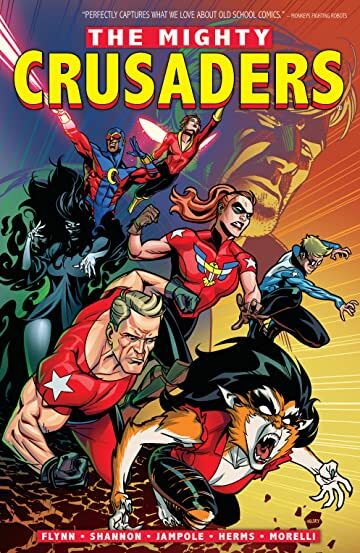 In writer Ian Flynn’s introduction, he says that The Mighty Crusaders is a spiritual successor to New Crusaders (put out under the previous Red Circle digital imprint) but not a direct sequel. He goes on the say that the connections between “New” and “Mighty” seen in the bonus “Dark Tomorrow” story can be taken as canon or not as readers like. I take this to mean, at least in part, that even though he wrote both titles, no one on the editorial staff wanted to bother with continuity checks or a putting out a bridging story. The four issues collected here show a team that endures each other’s presence more than they are a cohesive unit. They were put together more than brought together and it often shows. The core of the group has a preexisting history together, and part of the sort-of-canonical New Crusaders. The original Steel Sterling was brought out of retirement as a mentor figure, Darkling is just an outsider that the team is unsure of. The Sheild is still trying to figure out how to lead the team, while the previous Sheild calls the shots from behind a desk. The set up is perfect for lots of great interpersonal growth within the team, as well as superhero action. Even when they face the villainous Eliminators, there is a multi-generational subplot hinted at from them as well. While this story arc finishes, there are so many doors left open that it’s hard to believe this wasn’t planned to continue on. The ending was definitely felt elbowed in as a way to further justify and continuity questions, but also to open up for a total reboot if needed. I will admit I loved seeing the MLJ, original Red Circle, Impact, DC, and digital Red Circle versions of the Crusaders on a single page, along with the nod to Blue Ribbon Comics that often features the characters. Aside from the craziness of The Fox, The Mighty Crusaders is easily the lightest title put out by Dark Circle, and I think that might have been part of the problem. It feels very much like a throwback to something from the 90s. Even the preceding Sheild title was darker, and I think if they had done something closer to that it may have worked better. As well cleaning up the continuity out of The New Crusaders. The addition of New Crusaders: Dark Tomorrow didn’t help with that, either. It’s a great story, I’m glad it was included, but it just served to muddy the waters more. If this could have gone on for a bit longer, I truly believe it would have found its stride and been amazing. But it didn’t, and on its own, this ends up being pretty average, if not below average. I’ve got a stronger than normal nostalgic love for these characters, so for me it gets a disappointed 3.5 out of 5 stars. But this is one you should decide for yourself.